The organisation has gained a reputation for adapting its resources and methodologies to suit a diverse range of industry sectors. That flexibility and 'can do' approach that has paid dividends in terms of client retention and has enabled rapid expansion. The React Transport customer base reads like an A - Z of national and international commerce with Blue Chip companies, high street retailers, printing companies, specialist computer component manufacturers and bathroom product manufacturers, amongst others. These clients are served by an extensive fleet of more than sixty modern vehicles ranging from car derived vans to artics. After a thorough examination of available systems, the React Transport management team opted for the PODStar system from Manchester-based TouchStar Technologies. The Cloud-based PODStar system offers a 'Planning and Optimisation' tool that automates existing manual processes. Using real time job information, clients are able to drag and drop jobs onto the relevant vehicles. Once a manifest has been created it is then automatically sent out to the drivers remotely in the field. To further enhance the efficiency, via a click of a button, jobs are automatically allocated vehicles in the most efficient order and display the route on a map saving React fuel and time on the road. Once downloaded the driver can receive their jobs and complete in real time. React Transport delivery drivers are equipped with smart phones with the handheld device used for both proof of delivery / signature capture and tracking of the driver and vehicle location. Back at the React headquarters, management can view a real-time update on a map showing the fleet position as well as additional data and the job status and driver performance. 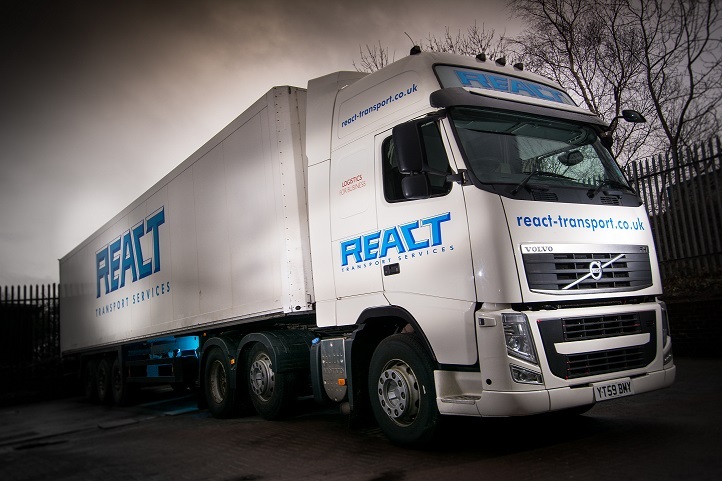 React Transport customers can login to the cloud-based system and enter jobs, view jobs and even track their deliveries, all of which as Simon Platts remarks "offers a significant advancement in the service that we provide to our valued clients". Simon Platts concludes: "The thoroughness of our initial search for a competent supplier has paid dividends. In TouchStar we found an organisation whose professionalism extended beyond the excellence of the PODStar product itself, right through to the installation and support aspects of the project. Our delivery drivers appreciate the simplicity and user-friendliness of the system and it's helped ensure that we're legally compliant. Our customers have expressed their appreciation of the client portal facility. Overall we're delighted with the system and, as we continue to expand, we and look forward to a long-term relationship with TouchStar." To discover more about React Transport please visit www.react-transport.co.uk.